It's The Attack Of BOARDZILLA!!! 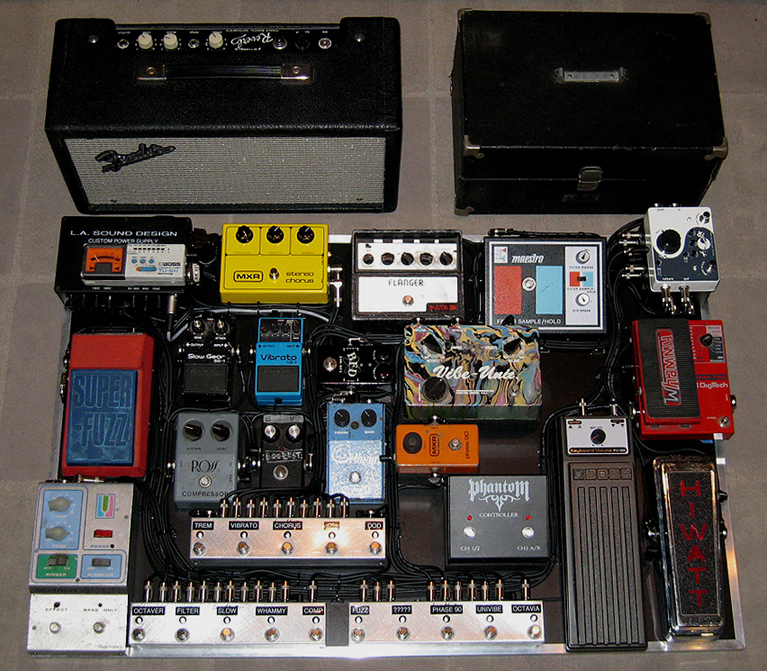 Discussion in 'Effects, Pedals, Strings & Things' started by John Ziegler, May 1, 2008. So LA Sound Design stepped up to the task! They told me that this is one of the biggest boards they've done(thanx mainly to the physical size of those old damn pedals! lol). The power supply and interface alone that Martin built took two days to make. also, the entire signal chain is dead-quite! The signal path is as follows: Custom interface (with built in buffer, power for three pedals, effects loop(EP-4 Echoplex), Fender Tube reverb loop(w/X-Blender), footswitch thru, tuner send)---Hi-Watt wah--Ross Compressor--Digitech Whammy--Boss Slow Gear--Maestro Filter Sample/Hold--Mutron Octave divider--Tycobrahe Octavia--Prescription Vibe Unit---MXR Phase 90--mystery pedal--Univox Super Fuzz--DOD Preamp 250--ADA Flanger--MXR Stereo Chorus--Boss Vibrato--BFD Tremolo--Interface. 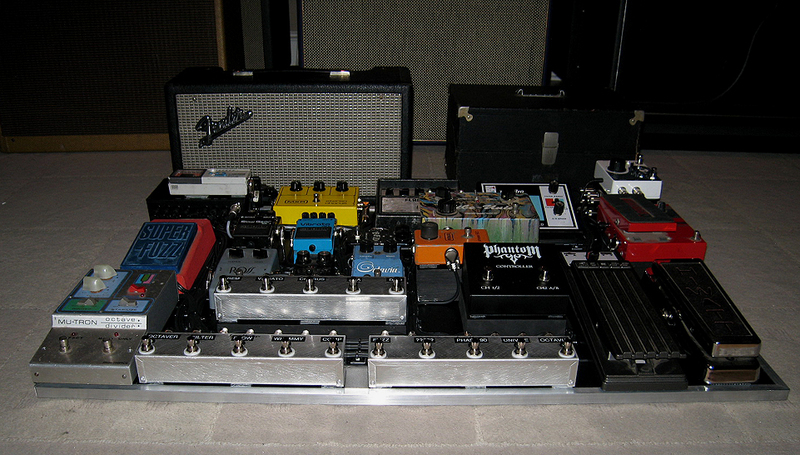 All the pedals except the Wah are in Loop Master strips. 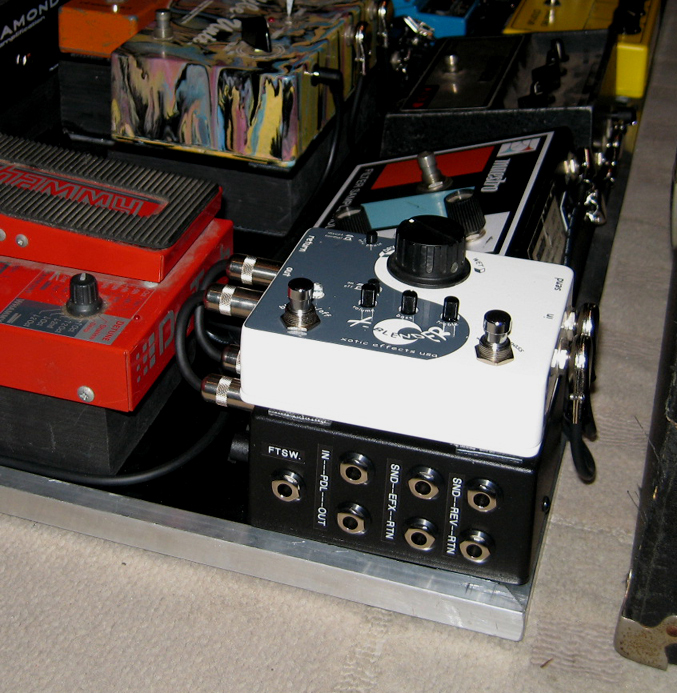 The effect loop send of the amp goes into the interface then to the Volume pedal then to the input of the Xotic X-blender out to a mid '70s Echoplex EP-4. The '66 Fender Tube Reverb Unit plugs into the reverb send of the interface into the Xotic X-Blender send and return(blending the dry and the reverb out to the effects loop return). I'm currently using a Diamond Phantom head into a 4x12 with G12H 30's. With the 25 ft audio snake, interface-connects, speaker cables, and guitar leads all Solid Cables www.solidcables.com , amazing stuff! btw, if you'll notice....it's ALL ANALOG too! So I'll be putting this monster into action asap, at my gigs around the LA area. I'm totally looking forward to making some really fun(and interesting) sounds with all this stuff! Hope you enjoy, and once again thanx so very much to Dave and Martin @ LA Sound Design, Nial @ Solid Cables, Toshio @ Xotic Effects, among many others! What a board!!!! Congrats man!!! Mucho dinero there!!! Z man I have had to burn your old rig diagram LOL !! 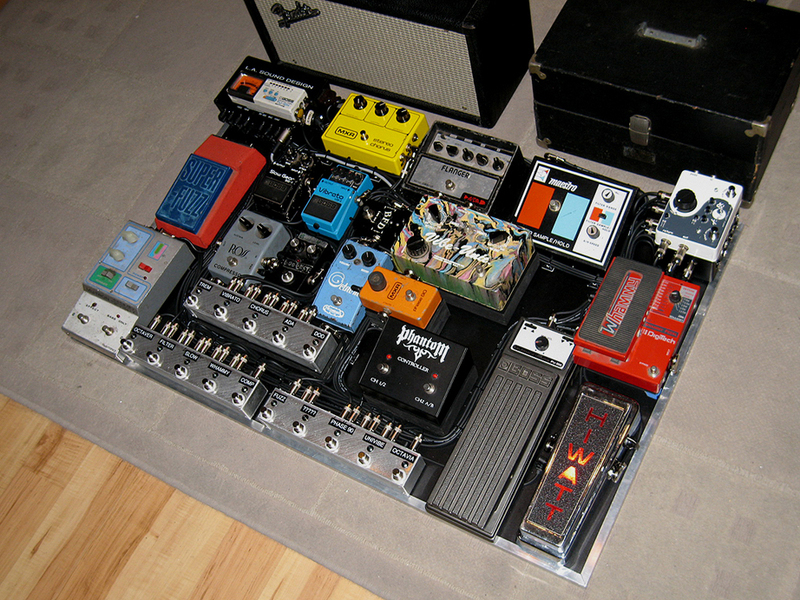 Awesome man kudos to the Dave/Martin.. awesome pedals love it. 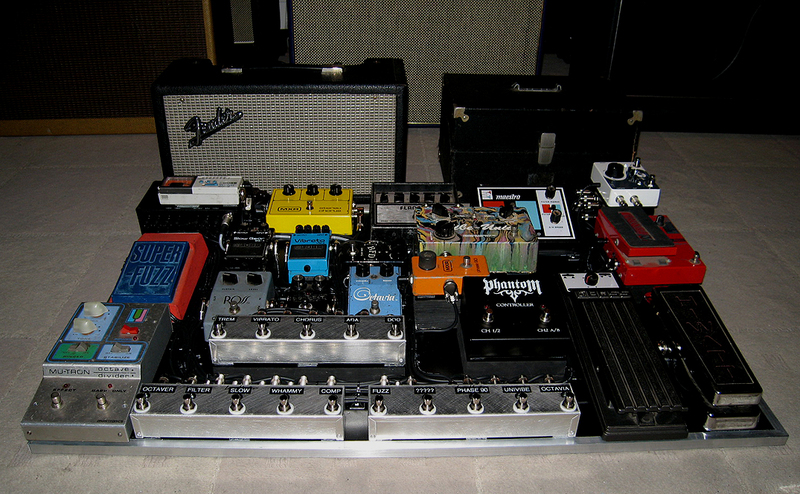 the cost of the board minus the pedals has got to be over a grand alone...maybe two? John, my back hurts just looking at that monster. They'll have to expand the stage at the potato. Cheers, bro! I can't imagine transporting that thing. Can you take a picture of it in its case, ready to go, next to you for scale? How much does it weigh? Great looking board, looks like a ton of fun. That's nothing... I could get all of those sounds out of my POD! Stellar work from the boys at LA Sound Design! Thou shalt not cover thy neighbor's Mutron Octave divider. You earned it, Bub. Love your playing. That is incredible! Thankfully, your fine playing will do it justice. I have one of the first swirly PE Vibe Units form Jack. It has never left my board in all those years---never heard better. we used to call vernon the mayor (because had a city of pedals and rack-mounted gear). looks like you're taking that **** over! Way cool John!! Martin really is the best! That is awe inspiring. Do you have to do yoga stretches to reach that Whammy in performance?